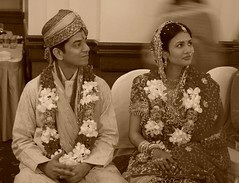 I have a list of must-do-before-I-die and and attending an Indian wedding (or getting invited to one) was one of it. Alok and Shruti’s 3-day wedding was perfect. Singing and dancing during Mehendi session. Pani Puri - They punctured a hole into this deep- fried ball, stuff some cooked spiced potatoes in it and then pour some green liquid inside. Quite tasty. Alok and Shruti are such great hosts. What do you do when your guests are drunk and danced-out? You feed them. But Alok did dance a storm. Lady in pink saree is Alok's mom. Alok's friends performing to the song "ohm shanti ohm"
Doesn't this look like an Indianized GAP ad? Check out the shoes. Apparently, the groom is supposed to arrive at the location on a horse (or an elephant, I can't remember) with a music band but the Leela Palace did not allow noise or animals, so Alok's friends had to sing loudly to simulate. Wedding ritual: pouring rice into fire. Not sure what is the significance but I'm sure Alok isn't sure either. The rituals went on for a while. The friends. Like a sore thumb. Weddings can be quite emotional. dude so nice that u were invited to an indian wedding!!! how did u score that?? ?